The classifications in the header on the cover sheet of Form PCT/ISA/237 are to be consistent with the classifications of subject matter in Box A on the second sheet of the International Search Report (Form PCT/ISA/210). The Boxes marked on the cover sheet represent a summary of the indications detailed on the subsequent relevant sheets of Form PCT/ISA/237. When completing Box No. I, item 1, of Form PCT/ISA/237, the examiner must indicate whether or not the opinion has been established on the basis of the international application in the language in which it was filed. If a translation was furnished for the purpose of the search, this must be indicated. Box No. I, item 2 of Form PCT/ISA/237 is to be marked when the opinion is established taking into account the rectification of an obvious mistake under PCT Rule 91. With respect to Box No. 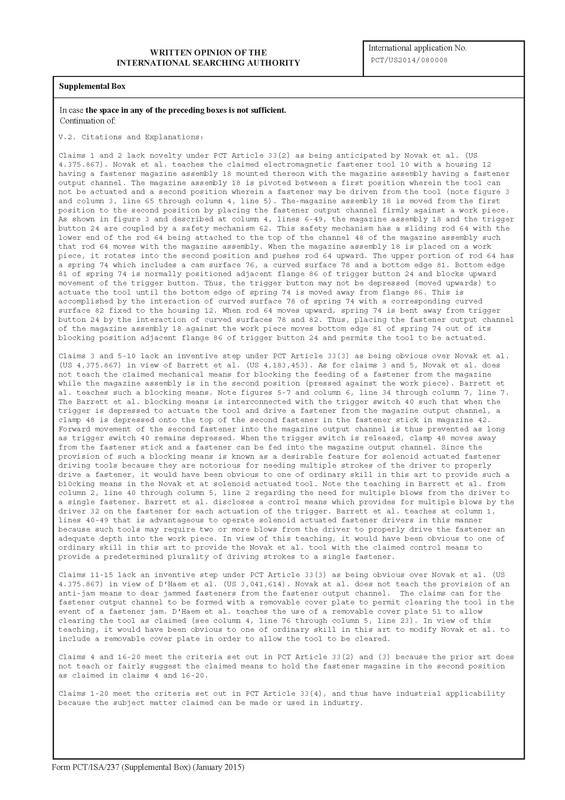 I, item 3 of Form PCT/ISA/237, if the opinion has been based on a nucleotide and/or amino acid sequence disclosed and necessary to the claimed invention, the examiner must indicate the format of the material (i.e., on paper/image or in electronic form (text)) and the time of filing/furnishing (i.e., contained in the international application as filed, filed together with the international application in electronic form (text) and/or furnished subsequently to the ISA for the purposes of the search). 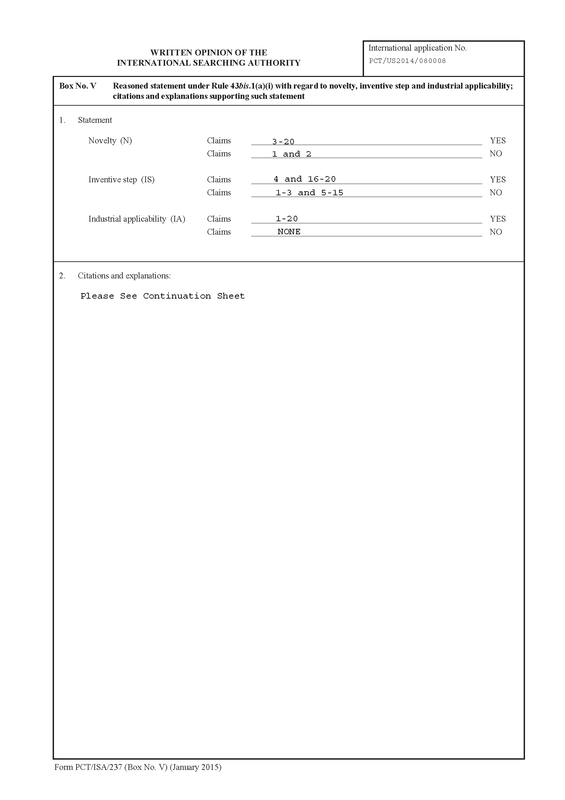 If more than one version or copy of the sequence listing is filed, the examiner must indicate in item 4 whether the applicant has provided the required statement indicating that the information in the subsequent or additional copies are identical to that in the application as filed or does not go beyond the application as filed, as appropriate. Item 5 is available for providing any additional comments. Box No. II of Form PCT/ISA/237 is to inform applicant of the status of a request for priority. Where one or more citations of the international search report were published after the earliest priority date, the validity of that earliest priority date requires checking. Where the priority document is one which is in the records of the ISA, it should be obtained from those records. If a copy of the priority document is not available before preparation of the written opinion of the ISA because it has not yet been provided by the applicant, and if that earlier application was not filed with that Authority in its capacity as a national Office or the priority document is not available to that Authority from a digital library in accordance with the Administrative Instructions, the written opinion of the ISA may be established as if the priority had been validly claimed. If the examiner needs a copy of a foreign priority document, the copy will be supplied on request to the International Bureau (IB) unless the IB has not yet received the priority document, in which case the examiner may invite the applicant to furnish such a copy. See PCT Rule 66.7(a). The examiner may consult with the Technology Center Quality Assurance Specialist or PCT Special Program Examiner regarding requesting a copy of the priority document from the IB. If the priority document is not in English, the examiner may invite the applicant to furnish a translation of the priority document within two months of the invitation. See PCT Rule 66.7(b). Box No. II, item 3, "Additional Observations" may be used to invite applicant to supply a copy of the priority document and/or translation. Preparation of the written opinion by the International Searching Authority should not be delayed to await a response to the invitation. The written opinion of the ISA will ordinarily be established as if the priority claim had been validly claimed even though the copy and/or translation has not been furnished. However, failure to timely furnish a copy of the priority document and/or translation may result in any further written opinion or international preliminary examination report of the International Preliminary Examining Authority being established as if the priority had not been claimed. 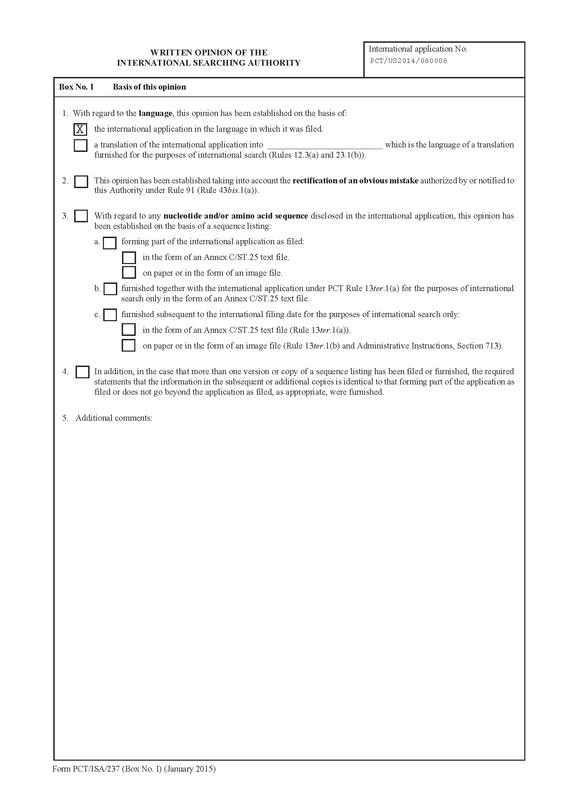 If applicant fails to furnish a copy or translation of the earlier application, whose priority has been claimed, check item 1 and then check the first box of the subsection if applicant failed to furnish a copy of the earlier application whose priority has been claimed, and check the second box of the subsection if applicant failed to furnish a translation of the earlier application whose priority has been claimed. When the claim for priority has been found invalid (e.g., the notification under PCT Rule 26bis.2(b) has been provided or all claims are directed to inventions which were not described and enabled by the earlier application), check item 2 in Box II and indicate why the claim for priority has been found invalid following item 3 "Additional observations." Box No. III of Form PCT/ISA/237 is intended to cover situations where some or all claims of an application are so unclear or inadequately supported by the description that the question of novelty, inventive step (nonobviousness), and industrial applicability cannot be considered, or where the international application or claims thereof relate to subject matter for which it is not required to establish a written opinion concerning novelty, inventive step and industrial applicability, or where no international search report has been established for the claims. If some or all of the claims of an application relate to subject matter for which it is not required to establish a written opinion concerning novelty, inventive step and industrial applicability, check the appropriate box, indicate which claims relate to that subject matter and specify the reasons e.g., improper multiple dependent claims that fail to comply with PCT Rule 6.4. If some or all of the claims of an application are so unclear that no meaningful opinion could be formed, check the appropriate box, indicate which claims are unclear and specify the reasons. If some or all of the claims are so inadequately supported by the description that no meaningful opinion could be formed, check the appropriate box. If no international search report has been established for certain claims, check the appropriate box and indicate the claim numbers. If the nucleotide and/or amino acid sequence listing does not comply with Annex C of the Administrative Instructions, the examiner must indicate whether the written form and/or the electronic form (text) is not in compliance and the reason for the non-compliance. Box No. IV of Form PCT/ISA/237 should be used by the examiner to notify applicant that lack of unity has been found by checking item 1, and one of the four boxes under item 1. If applicant paid additional fees for additional inventions, the examiner should check the first box under item 1. If the additional fees were paid under protest, the examiner should check the second box under item 1. Regarding the third box, since the ISA/US does not require a protest fee, this box would not be checked. If the search report is based on the first mentioned invention (no additional search fees were paid), the examiner should check the fourth box under item 1. Item 2 of Box No. IV is to be completed if the examiner determines that unity of invention is lacking but chooses not to invite the applicant to agree to a search limited to the first mentioned invention or pay additional fees. If a lack of unity exists, the examiner would mark the second box under item 3. However, since the reasons for the lack of unity have already been set forth on the simultaneously issued international search report, the examiner can simply state that the reason the requirement of unity of invention is not complied with is set forth in the international search report. The first box under item 3 would never be marked. Item 4 is used by the examiner to indicate which parts of the application form the basis of the opinion after the lack of unity of invention has been explained. The first box should be checked when the opinion is established for all parts. Otherwise, the second box is checked and the relevant claims identified. In Box No. V of Form PCT/ISA/237, the examiner must list in summary form all claims with regard to the criteria of novelty (N), inventive step (IS), and industrial applicability (IA). For definitions of novelty, inventive step, and industrial applicability see MPEP §§ 1878.01(a)(1), 1878.01(a)(2), and 1878.01(a)(3), respectively. Box No. V is the main purpose of the written opinion. All claims without fatal defects are treated on the merits in Box No. V as to novelty, inventive step (nonobviousness) and industrial applicability. The treatment of claims in Box No. V is similar in format to an Office action in a U.S. national patent application except that the words "rejection," "patentability," and "allowable are never used in a written opinion. On the international level, all written opinions are nonbinding and a patent does not issue; what does issue is an international preliminary report on patentability (IPRP), which is nonbinding on the elected States. Examiner statements in Box No. V can be positive or negative. If the claims define over the prior art and meet the test of novelty, inventive step (nonobviousness) and industrial applicability, a positive statement equivalent to detailed reasons for allowance in a corresponding U.S. national application should be provided, indicating how the claims meet the tests of novelty, inventive step and industrial applicability. Form paragraphs 18.04 and 18.04.01 may be used for this purpose. Claim  the criteria set out in PCT Article 33(2) -(3), because the prior art does not teach or fairly suggest . 1. In bracket 1, pluralize "claim" if needed, insert claim no. (s), and insert the verb --meet-- or --meets--, as appropriate. 2. In bracket 2, insert the details of the claimed subject matter that render it unobvious over the prior art. 3. If the claims also meet the industrial applicability criteria set out in PCT Article 33(4), this form paragraph should be followed by form paragraph 18.04.01. 4. If the claims do not meet the industrial applicability criteria set out in PCT Article 33(4), this form paragraph should be followed by form paragraph 18.03. Claim  the criteria set out in PCT Article 33(4), and thus  industrial applicability because the subject matter claimed can be made or used in industry. 1. In bracket 1, pluralize "claim" if needed, insert claim no. (s), and the verb --meet-- or -- meets--, as appropriate. 2. In bracket 2, insert --have-- or --has--, as appropriate. 3. If the claims meet all of the requirements of PCT Article 33(2)-(4), use form paragraph 18.04 before this form paragraph to provide positive statements for novelty and inventive step under PCT Article 33(2)-(3). 4. If the claims have industrial applicability but lack novelty and inventive step, use this form paragraph and additionally use form paragraph 18.01. 5. If the claims have industrial applicability and novelty but lack inventive step, use this form paragraph and additionally use one or more of form paragraphs 18.02, 18.02.01 and 18.02.02, as appropriate. 6. If the claims do not have industrial applicability, use form paragraph 18.03 instead of this form paragraph. If, on the other hand, it is the opinion of the examiner that some or all claims lack novelty, inventive step, or industrial applicability, specific reasons must be given similar to those used in U.S. national applications. Form paragraphs 18.01, 18.02, 18.02.01, 18.02.02, and 18.03 may be used, as appropriate, to explain the negative statements listed in Box No. V.
Claim  novelty under PCT Article 33(2) as being anticipated by . 1. In bracket 1, pluralize "claim" if needed, insert claim no. (s), and the verb --lack-- or --lacks--, as appropriate. 2. In bracket 2, insert name of prior art relied upon. 3. In bracket 3, add reasoning. 2. In bracket 2, insert name of PRIMARY prior art relied upon. 3. In bracket 3, insert name of SECONDARY prior art relied upon. 4. In bracket 4, add reasoning. 1. This form paragraph may follow either 18.02 or 18.02.01. 2. In bracket 1, pluralize "claim" if needed, insert claim no. (s), and the verb --lack-- or --lacks--, as appropriate. 3. In bracket 2, insert name of additional prior art relied upon. 4. In bracket 3, add reasoning. 2. In bracket 2, add reasoning. Examiners are encouraged to indicate any amendments which applicant could present which would avoid a negative statement in the international preliminary examination report in the event that applicant chooses to file a demand. 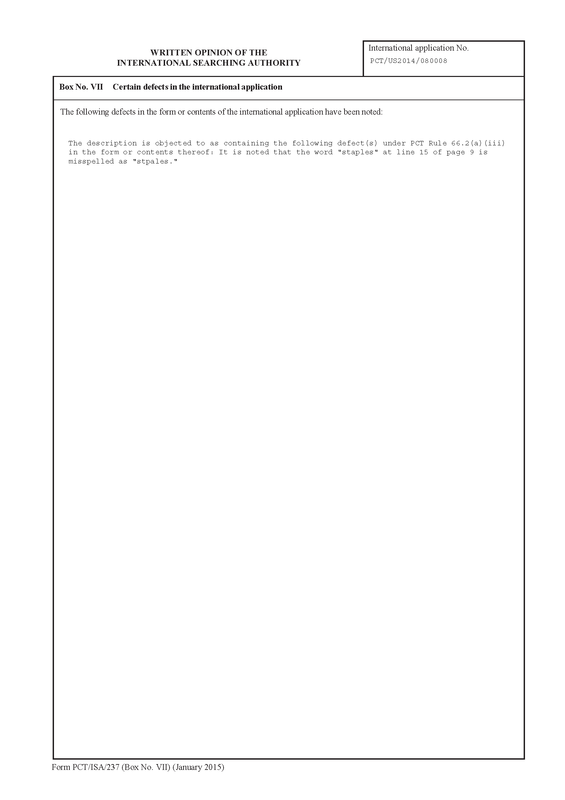 Since all documents cited at the time of establishment of the written opinion will be listed on the simultaneously established search report, there is no need to also list them on the written opinion, and as such this box should be left blank. In Box No. VII of Form PCT/ISA/237, defects in the form and content of the international application are identified. Defects that would be listed in Box No. VII include informalities such as misplaced and/or omitted drawing numerals, misspelled words, and grammatical errors. The following form paragraphs are used in Box No. VII of PCT/ISA/237, "Certain defects in the international application," for noting technical defects. In bracket 1, insert identification of defects in drawings. The subject matter of this application admits of illustration by drawing to facilitate understanding of the invention. Applicant is required under PCT Article 7(1) to furnish a drawing. In bracket 1, insert the technical problem, e.g., misspelled word. 1. In bracket 1, pluralize "claim" if needed, and insert claim no.(s). 2. In bracket 2, identify the technical deficiency. In Box No. VIII, the examiner notifies the applicant of observations made as to the clarity of the claims, the description, the drawings, or on the question whether the claims are fully supported by the description. If the claims, the description, or the drawings are so unclear, or the claims are so inadequately supported by the description, that no meaningful opinion can be formed on the question of novelty, inventive step (nonobviousness) or industrial applicability, the applicant is so informed in Box No. III. See PCT Article 34(4)(a)(ii). Reasons for the examiner’s opinion that the claims, description and drawings, etc., lack clarity must also be provided. If the above situation is found to exist in certain claims only, the provisions of PCT Article 34(4)(a)(ii) shall apply to those claims only. If the lack of clarity of the claims, the description, or the drawings is of such a nature that it is possible to form a meaningful opinion on the claimed subject matter, then it is required that the examiner consider the claims and render a written opinion on novelty, inventive step, and industrial applicability in Box No. 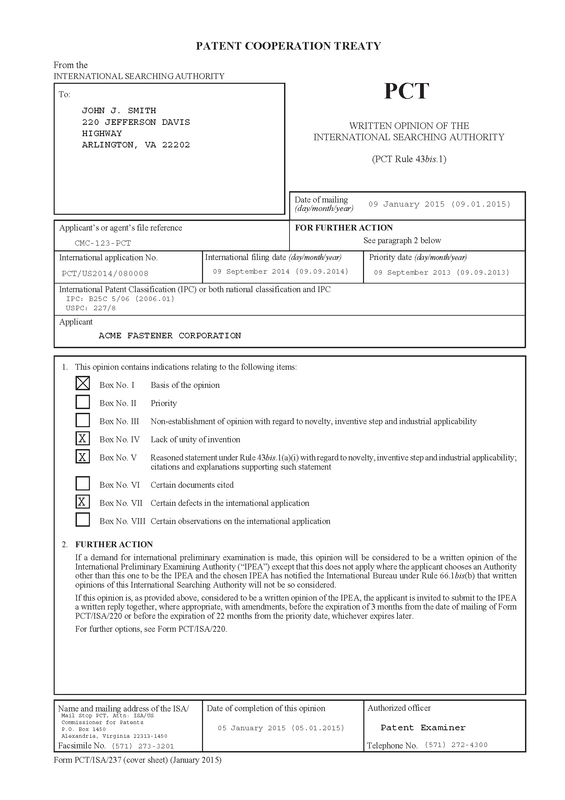 V.
Since the claims of an international application are not subject to a rejection on either art or indefiniteness consistent with U.S. practice, observations by the examiner with regard to clarity of the claims, the description and the drawings will be treated in the form of an objection in the written opinion in Box No. VIII. The following form paragraphs may be used in Box No. VIII, "Certain observations on the international application," of Form PCT/ISA/237 for noting objections which are substantive rather than merely technical in nature. In bracket 1, insert reasons why the drawings lack clarity, e.g., inaccurate showing. 1. In bracket 1, pluralize "claim" if needed, insert claim no. (s), and the verb --is-- or --are--, as appropriate. 2. In bracket 2, pluralize "claim" if needed, and insert the verb --is-- or --are--. 3. In bracket 3, identify subject matter not described in the application as filed. 1. In bracket 1, pluralize "claim" if needed, insert claim no. (s) and the appropriate verb --is-- or --are--. 2. In bracket 2, pluralize "claim" if needed, insert the verb --is-- or --are--. 3. In bracket 3, identify the claimed subject matter that is not enabled and explain why it is not enabled. Claim  objected to under PCT Article 6 because the claim  not fully supported by the description. The description fails to set forth the best mode contemplated by the applicant for carrying out the claimed invention as required by PCT Rule 5.1(a)(v) because: . 2. In bracket 2, pluralize "claim" if needed, and insert the appropriate verb --is-- or --are--. 3. In bracket 3, insert the objection and reasons. 1. In brackets 1 and 2, pluralize "claim" if needed, insert claim no. (s) and the appropriate verb --is-- or --are--. 2. In bracket 3, insert reasons. Pursuant to PCT Rules 43bis.1 and 70.14, the written opinion of the International Searching Authority must indicate the name of the officer of the International Searching Authority responsible for the written opinion, i.e., the "authorized officer." An "authorized officer" is the person who actually performed the search work and prepared the search report and the written opinion, or another person who was responsible for supervising the search and the establishment of the written opinion. See PCT Administrative Instructions Section 514. Thus, an examiner need not have signatory authority in order to be named as an authorized officer on the written opinion. However, the "file copy" of the written opinion must be signed by an examiner having at least partial signatory authority. 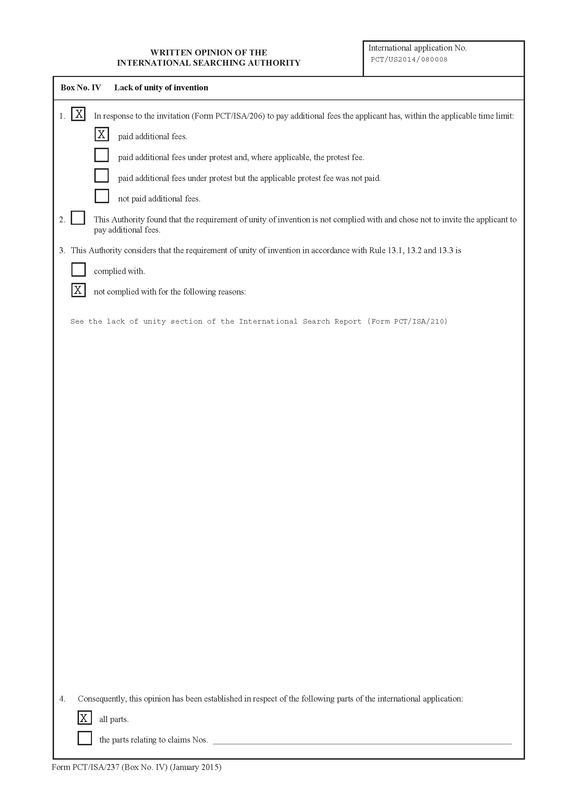 If, in response to the written opinion of the International Searching Authority (Form PCT/ISA/237), applicant wishes to file a demand and amendments and/or arguments, the time period for response is 3 months from the mailing of the international search report and the written opinion or before the expiration of 22 months from the priority date, whichever expires later.